The HALO Bassinest Newborn Insert is exclusively designed to help your newborn transition from the comforting security of the womb to sleeping independently in the HALO Bassinest Swivel Sleeper. 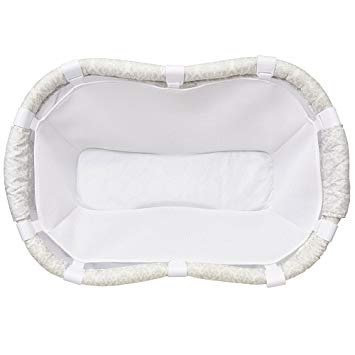 Made of breathable mesh fabric, it provides a narrower sleep space around your newborn, to help him feel more secure for a better night’s rest. It’s firm, flat sleep surface is designed to rest on top of the Bassinest mattress ensuring safe sleep for your baby. (It is not a baby hammock). And, its sturdy hooks attach easily and securely to the Bassinest and stay in place while lowering the side wall to lift or soothe your baby. The HALO Bassinest Newborn Insert should be the only sleep insert used with the HALO Bassinest Swivel Sleeper. For babies up to 15 lbs. Discontinue when baby shows signs of rolling over.